Seems like only a few days ago I was saying how hard it was to believe it was October and now it is almost November! My least favorite holiday of the whole year is Halloween. The students all seemed to over-react, everyone was on a sugar high, and the Drug Free School week always seemed to bring out the morbid side of the kids! It is just so hard to believe it is tomorrow! As you read this update, the CASE office is already relocated to Reno, Nevada! The CASE Executive Committee will be meeting on Tuesday and the Board of Directors will be meeting all day on Wednesday and Thursday morning. The conference will begin on Thursday with lunch! If you are not headed to Reno, I hope you will start making your plans to attend the fall conference next year in Biloxi, Mississippi, at the Beau Rivage, Nov. 8-10, 2018! Watch my updates in March and April for the call for proposals! 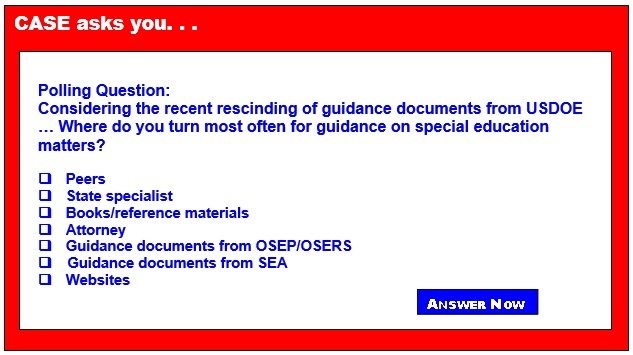 One of the things we will be talking about at the Board meeting will be the recently announced rescinded guidance documents from OSERS. There was a stakeholder conference call on Oct. 24 and at least 5 of the CASE executive committee and staff were on the call. A memo was released on Friday, Oct. 20, 2017 that 72 guidance documents relating to the Individuals with Disabilities Education Act and the Rehabilitation Act of 1973 have been rescinded due to being outdated, unnecessary, or ineffective. On Monday, additional information was released by OSERS. Our CASE Legislative consultant, Myrna Mandlawitz will be updating the board next week and we will be passing additional information along to all of our members. Be sure to watch this weekly update! Speaking of just released... CASE has been a member of the NDD United Coalition from the beginning. On Oct. 25, 2017, NDD United rolled out "Faces of Austerity 2.0: How Budget Cuts Continue to Make Us Sicker, Poorer, and Less Secure." You can get this online report at www.raisethecaps.org. NDD United has had a number of events throughout last week to accompany its release. BUT... you can help continue to make as much noise as possible until Congress comes together to raise the austere funding levels. There is a toolkit with a number of resources to help organizations and grassroots get engaged in both traditional and social media. Please look at and share this toolkit, or the parts you think are appropriate far and wide. They have left the toolkit in Word format to make it easy for you to cut and paste for your own campaigns. We all complain about not having sufficient funds, this is a great online report and accompanying resources to help tell our story. Please use them and pass the word! Have you registered for CEC in Tampa, Florida, Feb. 7-10? For as long as I can remember, CEC has held its conference in April and for the last 15 years or so, it has conflicted with state testing programs! So, CEC leadership decided to move the conference to a time better suited for teachers and others connected with schools. The program will be amazing and this will be a conference you do not want to miss. Check out all te information from programs to hotels to workshops at the dedicated conference website. Speaking of the CEC Conference — CASE NIGHT tickets will be going on sale Nov. 1! We are so excited about this year's CASE Night — a dinner cruise on Tampa Bay! The boat will leave just steps away from the convention center so no added transportation. Tickets will be $65 but remember it is sponsored so for that amount, you are really getting an event that is worth much more! Our very special sponsors are Star Autism and Sonday System! The tickets are limited so mark you calendar and get your tickets at www.casecec.org starting Nov. 1 — that is this Wednesday! The question last week was "which best describes the reason you attend International CEC Conference?" I have to admit it makes me proud to know the number one reason given at 55 percent was to attend Division/CASE activities! Coming in 2nd with 36 percent was learning about national trends and issues. And the third reason at 9 percent was networking with others. I hope to see you at the CASE annual member meeting on Wednesday, Feb. 7 — we even provide you with a FREE full breakfast as well as all the other great CASE activities. But, that means you need to register for the convention and of course get your CASE NIGHT tickets! Enjoy these last few days of October, don't eat too much Halloween candy, and definitely don't forget to get your CASE Night ticket starting this Wednesday at www.casecec.org. Punishment is a term and/or a practice that has many different meanings and/or practices depending on a person’s profession or frame of reference. Some schools might consider punishment to be an instrument or tool to compensate for a loss, damage, or injury. In other instances, it is used to obtain retributive justice against an offender or violator. In a way, punishment is sometimes used as a means of restoring a disturbed environment or state to its original setting. Regardless of the definition or viewpoint, punishment can be problematic as it typically evokes negative side effects (e.g., avoidance, escape behavior, aggression). In fact, many people find punishment to be unethical because it is typically associated with inflicting some type of harm, pain, or discomfort to students in an effort to change their behavior.